Best Western Plus Carapace Hotel Khao Tao is owned by One Place Estate Co., Ltd. 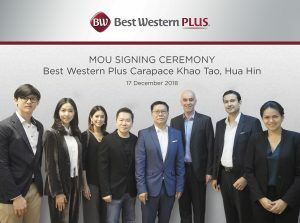 The signing ceremony was held on December 17, 2018, and attended by Mr Pongpipat Kanjanasupat (4th right), Mr Suvichai Janethanaarthakij (4thleft), CEOs of One Place Estate, and Olivier Berrivin (3rdright), Managing Director of International Operations – Asia, Best Western Hotels & Resorts. Easily accessible by road from Bangkok and the city’s two international airports – Suvarnabhumi and Don Mueang – Hua Hin is a vibrant resort town that has attracted Thai and international visitors for many years. 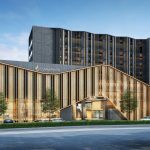 It is now better connected than ever before, following the recent launch of ferry services from Pattaya and direct international flights to Hua Hin Airport from Kuala Lumpur. The Thai government is also investing in a major project to expand Hua HinAirport over the next five years.